Once upon a time, on a world that was before our world, there lived Uxas. Uxas had a sister named Avia who had a husband named Izaya. As the Old Gods were fighting, they tore apart the city Uxas and his family lived in. Uxas did not believe that the gods had their best interests at heart, so instead of praying to them, he climbed the Forbidden Mountain on which they reside and he made the gods go to war with each other. One god, beaten and broken, asked Uxas for a prayer as the gods lived on faith. Instead, Uxas murdered him. He then proceeded to murder all the other gods, two, ten, all of them, and then Uxas was gone, replaced by Darkseid. On the ground below the mountain, Izaya runs carrying his wife but is stopped by one of the gods, who is dying. He gives Izaya his own power and then he becomes the Highfather. Highfather fights Darkseid and tells his former brother that they are the New Gods and that they can fix what is broken in the universe. Darkseid doesn't agree and decides to destroy their planet. Later, we find that Darkseid is the ruler of Apokolips. On Apokolips, Kaiyo, the Trickster (see current issues of Batman/Superman for more) causes some strife between some Parademons, which Darkseid does not like. Darkseid chases her until she teleports away. Attempting to follow, Darkseid discovers Earth-2 and the Superman of it. 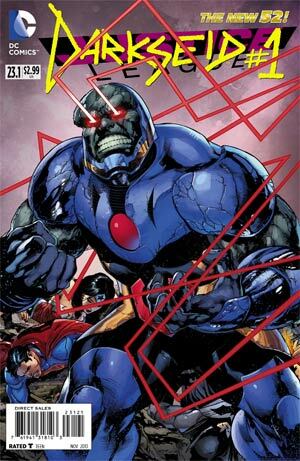 Wanting to defeat someone whose power rivals his own, he invades Earth-2; and although the heroes of Earth-2 stop the invasion, Darkseid takes Superman for himself. Finding Kaiyo again, Darkseid follows her to countless realities and he destroys world after world after world. Until he gets to the New Earth. The Justice League form to take Darkseid on and they eventually beat him. Back on Apokolips, Darkseid thanks Kaiyo for showing him all the other worlds and then walks into a chamber where he has Supermen lying dead on the ground. Where will Darkseid strike next? Read Batman/Superman & Earth-2! Story - 4: I think that the Villain's Month idea that DC is doing for this month of September (like the Faces of Evil one they did a few years back) is a great way to get people interested in these books. Some books like Justice League, Action Comics, Superman, and all four Batman books have four Villain's Month issues each, but others like Aquaman, Batman/Superman, and Teen Titans only have one or two. Well, Justice League as I said above has four, and what better way to start off Villain's Month (and the JL tie-ins) then with Darkseid?! I know there's probably a lot of negativity towards this story because of the changes made to the origin of both Darkseid and the New Gods, but if I'm being completely honest, and I am, I actually think I may like this version better. I really enjoyed this story and it's a very interesting take on why Darkseid hates Superman so much. Because at the end of the day, Darkseid really is a DC Universe villain; he fights any hero and has fought the JL many times. However, Darkseid has always had a specific hate for Superman above all other heroes, villains, and people in the DCU. Greg Pak did a great job at addressing that here. I thought it was interesting that Uxas, Darkseid before he was Darkseid, killed all the Old Gods so that he could have the power himself. It seems to me like he and Highfather are less equal then they were in the Post-Crisis/Pre-Flashpoint universe, which may not be a bad thing, but is certainly a change. Also, did anyone else think that Darkseid's daughter was going to be mentioned here? I sure did! They've been teasing that in Justice League, Vibe, and other titles for a good while now, and I want some answers! Oh well, I'm sure we'll find out sooner-or-later. I hope I'm not the only one who thought that Darkseid's army of dead Supermen was a little creepy and unrealistic. I would think that more Supermen than not would have defeated Darkseid and saved their world (especially Earth-2 Superman, who yes did ultimately save his world, or at least helped). I find it a little hard to believe that Superman, any version of Superman (including Ultraman), would fall that easily to Darkseid and let his/their world(s) be destroyed. I hope that plotline continues further down the road. Finally, I thought it was interesting that Kaiyo was the one who showed Darkseid Earth. It makes perfect sense if you read Batman/Superman's current arc (also written by Greg Pak) that she would be responsible as it seems that pretty soon after that arc ends, Earth-2 is invaded (and of course the invasion in Justice League as well). Overall, very good continuity here. Next week, Ralph will be back to review Justice League #23.2/Lobo #1 and I will return the following week. After Villain's Month (and I won't say much because I'm sure Ralph will want to say something as well), I will be taking over Justice League as well as staying on Batman/Superman and Smallville: Season 11 (with Marc Pritchard). Ralph will be covering Superman/Wonder Woman, I believe (God bless his soul), after this month. So until Justice League #23.3, I'll see you guys later! Art - 4: I liked the art. I didn't absolutely love it, but I did like it. Kudos to the guys who worked on this book! Cover Art - 5: What can I say? I really like covers where the villains are standing over our heroes showing them in defeat. Now, this story really had nothing to do with the Justice League so it may be a bit of a cop-out, but I thought it looked cool, especially since it's Superman, Wonder Woman, and Batman that we see lying on the ground. Kudos to Ivan Reyes, Joe Prado, and Alex Sinclair for a great cover!